In the last 15 days, the rates have gone through the roof and the key vegetable is being sold at Rs 80-100 per kg by local vegetable vendors depending on the quality and locality. Tomato prices which have soared to Rs 80-100 per kg in retail markets across the country are likely to remain elevated for at least next two months as fresh crop is expected to hit markets only by August-end. Normally, prices of tomato firm up in the off-season of June-September every year, but the sharp increase in rates this time was mainly due to the damage caused to the rabi crop because of a severe drought in southern states. For instance, in the national capital, tomato is being sold at Rs 58 a kg at Mother Dairy's Safal outlets and Rs 80 at Godrej's Nature Basket. 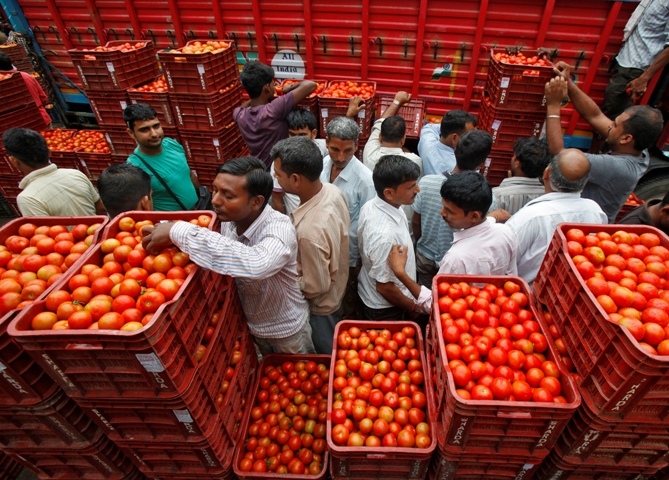 Online portal Bigbasket is selling tomato at Rs 55 in Delhi, Rs 70 in Kolkata, Rs 78 in Bangalore and Rs 79 in Chennai. "Prices have gone up because of tight supply from the major growing states of the South where the rabi crop has been damaged during the flowering stage because of the severe drought," a senior Consumer Affairs Ministry official said. "The fresh tomato crop is expected to arrive only in September and till then prices are expected to remain under pressure." According to the government's initial calculations, tomato output is estimated to be higher by 4-5 per cent in 2015-16 over the last year. "It looks like the production figures may have to be revised downward when final estimates are to be released in September," the official added. As per the latest government estimate, the country's tomato output is pegged at 18.28 million tonnes in the 2015-16 crop year (July-June) as against 16.38 million tonnes in the previous year. On Wednesday, Food and Consumer Affairs Minister Ram Vilas Paswan had said the rise in tomato prices was a "seasonal factor" and the commodity cannot be procured using the Price Stabilisation Fund due to short-shelf life of the key vegetable. The government is procuring pulses and onion to create a buffer stock to be used for controlling prices by boosting supply in the open market at a cheaper rate. Pulses at Rs 170/kg! What is Modi govt doing about it?